The only common mineral with perfect cleavage in four directions is Fluorite, also called fluorspar. Composed of calcium and fluorine, Fluorite is a 4 on the Mohs scale of hardness, with 10 being the hardest. It’s found in China, Mexico, Canada, England, Germany, South Africa, and several other countries. Known as the “genius stone,” Fluorite is believed to help in absorbing new information; it’s thought to stir creativity and encourage both hemispheres of the brain to work in harmony. Students can use it to improve memorization and retention. Ancient Egyptians carved Fluorite into vases and statues. American Indians, Celts, Germans, and Russians carved Fluorite into amulets and dining ware. Emperor Nero reportedly paid $250,000 (in today’s prices) for one Fluorspar cup. In the 1700s, hydrofluoric acid diluted with water was used to alleviate kidney disease, shrink varicose veins, grow hair, and cure sores on the fingers and in the nostrils. 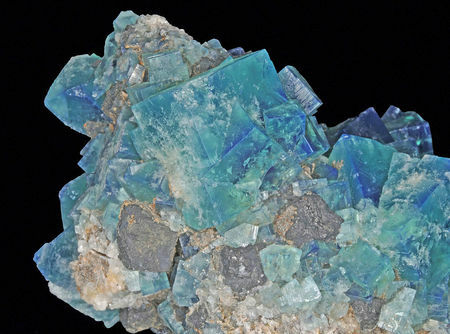 Fluorite is the state mineral for Illinois, which once served as the country’s leading producer of Fluorspar. This highly protective and stabilizing mineral is widely used for manufacturing, glazing (Teflon is made from one of its derivitives), metal production, and optical equipment like telescopes. Pure Fluoride is colorless. When other elements substitute for the calcium, various colors result, including purple, green, blue, yellow, and rainbow. As expected, each color carries its own particular metaphysical properties and is attuned to specific Chakras. For instance, blue Fluorite heals the Third Eye and Throat Chakras, brings a calm rational energy, and fosters communication skills. Green Fluorite resonates to the Heart Chakra, helps release emotional trauma, and clears negative energy from the environment. Purple Fluorite heals the Third Eye Chakra and helps increase self-confidence. While Fluorite isn’t a traditional birthstone, it’s the Zodiac stone for Pisces (Feb. 19 – March 20). 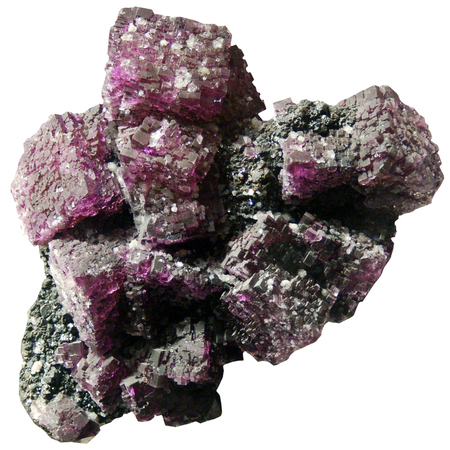 Feng Shui experts say Purple Fluoride uses fire energy and should be placed in the south area of a home or room. Because Fluorite is so soft, it’s best to buy it in protected settings like pendants or brooches. Avoid wearing Fluorite jewelry while cleaning or exercising, clean it with soapy water and a soft cloth, and store apart from other jewelry. This entry was posted in Sunday's Gem and tagged Fluorite gemstones, Fluorite properties, healing gemstones, metaphysical healing. Bookmark the permalink. It’s interesting that its color can vary depending on which chemical takes the place of the calcium. The blue is beautiful. Etymologically at least, it might be the perfect stone for someone who aspires to fluency in speaking or writing. Good point, Linda! I imagine most of us are more familiar with Fluoride’s use as an anti-cavity agent. Some specimens are fluorescent. The Fluorite beads I’ve come across are typically a purple color, but that blue is gorgeous, isn’t it? Wouldn’t it be wonderful to have eyes that color, Kim?!? As do I, John. Thanks for stopping by on your busy Sunday! A stone I’ve never heard of before! But if it does all that information retention stuff, I really need some… ;) What does “with perfect cleavage in four directions” mean? Isn’t it beautiful? I like that it’s the “genius stone”!! As for the cleavage part, basically (and without going into scads of geometry which I confess I snoozed through! ), “cleavage” refers to the way some minerals break along lines of weakness in their structure. Fluorite breaks into perfect octahedrons (eight faces, 12 edges, six vertices). Now, aren’t you glad you asked, heehee?!!! Really?? I’m thrilled I didn’t overwhelm you!! Debbie, I think out of all the gemstones you’ve ever hightlighted, Fluorite, is the one you’ve educated me on the most because I knew none of these fascinating facts. “Pure Fluoride is colorless. When other elements substitute for the calcium, various colors result, including purple, green, blue, yellow, and rainbow. That’s amazing. I had no idea!?!? Most gemstones come in slightly variety shades of the same color. However, Fluorite is unique in that it takes on various colors, depending on the calcium. Kind of like the “horse of many colors” in the movie, The Wizard of Oz, HA! You taught me a great deal about this particular gemstone, my friend. THANK YOU! P.S Love both the photographs you shared of the various colors! Ron, it’s not often that I can feature a gemstone you know little about, and I’m awfully glad I did this time! I imagine Fluorite would be a good stone for your Reiki healing case. I might as well admit that I didn’t know all this stuff either. I know what I like, what I gravitate toward, but as for the healing properties of individual gemstones, a lot of that eludes me. That’s one reason I came up with the idea of spotlighting various gems — so I could learn right along with everyone else. Since I’ve never seen Fluorite in such a stunning blue color, I know I had to include a photo of it. Stunning gem. I’d love to have a big piece of one in my office. The colors bring me a peaceful feeling.